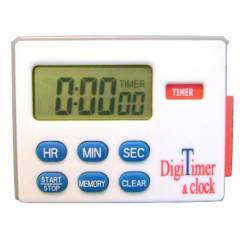 Timers with 3 functions: Count down 24H-59M-59S. Check delivery and payment options ? * 7 days free return, Bulk Orders (greater than 10) & heavy items are shipped through surface & may take more than 10 days for delivery. Want to buy even more quantity? Alla-France 91500-014/A Digital Timer is a premium quality Digital Indicators from Alla-France. Moglix is a well-known ecommerce platform for qualitative range of Digital Indicators. All Alla-France 91500-014/A Digital Timer are manufactured by using quality assured material and advanced techniques, which make them up to the standard in this highly challenging field. The materials utilized to manufacture Alla-France 91500-014/A Digital Timer, are sourced from the most reliable and official Digital Indicators vendors, chosen after performing detailed market surveys. Thus, Alla-France products are widely acknowledged in the market for their high quality. We are dedicatedly involved in providing an excellent quality array of Alla-France Digital Indicators.